This engraved stone was found at a depth of about 3.5 feet (106.7 cm) on the Gault site by David Olmstead. 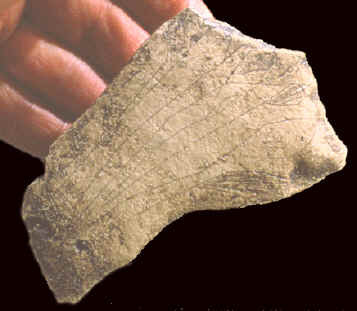 A complete and undamaged Clovis point was also found nearby. This engraved stone has been referred to as the "Wheatstone" because the design seems to illustrate growing plants. Both sides are engraved with five to eight vertical lines that extend upward from a horizontal line. Each vertical line was then engraved with a diamond on the end. Some of the diamonds are filled with vertical parallel lines. This engraved stone measures 4 1/16 inches (10.2 cm) long, 2 5/8 inches (6.6 cm) wide and 5/16 on an inch (7 mm) thick. The Gault site is located in south central Texas in Williamson County and covers an area estimated to be a half mile by a little over a tenth of a mile wide (0.8 by 0.2 km). It is classified as a stone tool manufacturing and habitation site. The Gault site has produced Clovis points, point preforms, tools made from blades, cores, burins and small engraved stones. Recent excavations (1998--2002) by archaeologists from the Texas Archaeological Research Laboratory at the University of Texas at Austin has recovered approximately 800,000 artifacts. One of the most important artifact types to have been recovered from the Gault site are the engraved stones. By 2001 at least 30 engraved stones had been found. Their direct association within the Clovis horizon at Gault is a significant discovery. 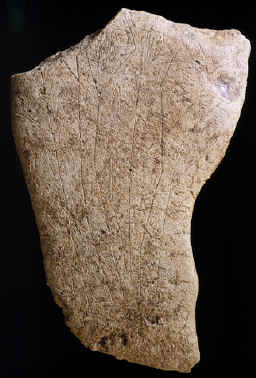 Engraved stones from this early period in North America is almost unknown. In 2002 there was an important discovery of a 6 by 6 foot pavement of gravel that has been interpreted as evidence for one of the earliest man-made structures found in North America.